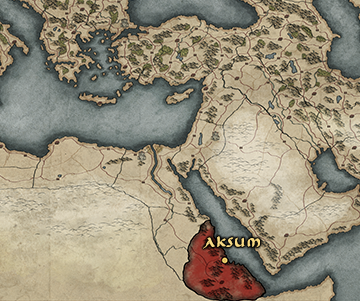 The Kingdom of Aksum, from its position on the Red Sea coast, grows prosperous through trade; the Silk Road is kind to those who know how to harness its riches, and the Aksumites have spent their lives trading along it. Aksum's Eritrean and Ethiopian heartlands have been occupied for hundreds of years - monuments and burial sites have dotted the landscape since at least 400BC, and the bountiful Hatsebo Plain and the stream at Mai Hedja have enabled the kingdom to flourish - but since around the 1st century AD it has grown significantly in both size and population, due in no small part to its position on the hugely lucrative trade route to India and beyond. Zoskales, who was probably the first Aksumite king, held dominion over the Red Sea port of Adulis, and grew powerful from trade. His descendent, King Ezana, converted to Christianity during the 4th century AD, and it is now prominent amongst the ruling elite and ordinary people alike. When a nation becomes so rich and powerful it is bound to attract enemies who wish to monopolise its trade and steal its wealth for themselves. The neighbouring Himyarite Kingdom of southern Arabia is one such adversary. As the 5th century dawns, military and religious lines have once again been drawn in the sand - Aksum enjoys Rome's favour, and the wealth of the world fills its coffers - let those who would challenge that might face Aksumite steel, and feel Aksumite strength! When only the hardiest of men survive here, it takes a special breed to thrive and prosper. 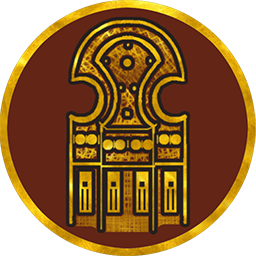 Comprised of royal officials, high-ranking officers and ministers, the elders offer wise counsel and keep their ruler's power in check. Styled the kings of "Saba and Salhen, Himyar and Dhu-Raydan", Aksum's powerful hereditary monarchs are elite warriors in the service of Christ.